Vice President Biden at the Reopening of Joplin High School: “We Never Stop. And We Always Rebuild. The tornado that hit Joplin, Missouri on May 22, 2011 lasted 32 minutes and caused damage for 13 miles. At its widest point, the path of the tornado stretched a full mile. The EF5 Tornado — the most destructive on the Enhanced Fujita Scale — left a city nearly destroyed. More than 15,000 vehicles were carried away, nearly 7,000 homes were completely destroyed, and 161 people lost their lives. The destruction of Joplin High School took place just minutes after a graduation ceremony for seniors. The ceremony was held off campus, at Missouri Southern State University. When the tornado hit, around 150 people were still in the arena, and Dr. Kerry Sachetta, the high school principal, led those individuals into the basement. But others were already on the road or back in their homes. The tornado claimed the lives of seven students (including one of the graduates) and one high school staff member. Despite the destruction, Joplin’s citizens showed a tremendous resolve to rebuild, and through the efforts of volunteers, neighboring cities and states, the government, and most importantly, the people of Joplin themselves, the community has made a dramatic recovery. 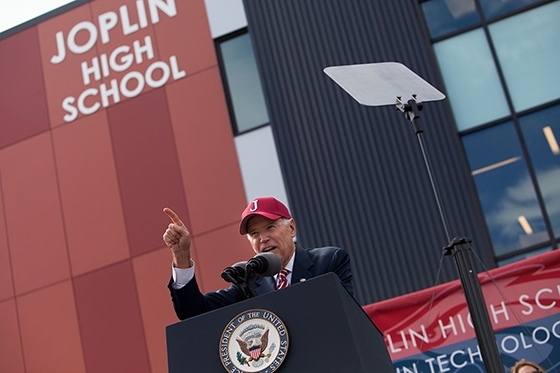 Last week, Vice President Biden and Secretary of Education Arne Duncan, returned to Joplin to celebrate the reopening of Joplin High School. "We never bend. We never break. We never stop. And we always rebuild." The new Joplin High School/Franklin Technology Center isn’t just a new building, but a new vision of education for the community’s students. The opening also marked the launch of the Career Path curriculum. Students attending JHS/FTC can choose one of five Career Paths, which are developed and implemented by school, community, and business representatives, centered on core foundational knowledge and skills, plus the soft skills employers demand from their employees. What they saw is the character of this community. Anyone in America would want to be part of a community that has hung together like his one, that had the grit that this one has shown. The day will come when students walking through these doors will have no personal memory of May 22, 2011. But they will always know the values of the community that raised them, the ball fields they played on, and the legacy of recovery. And for the rest of them, and for the rest of their lives, they’ll be able to say: We are Joplin. We are Joplin strong!